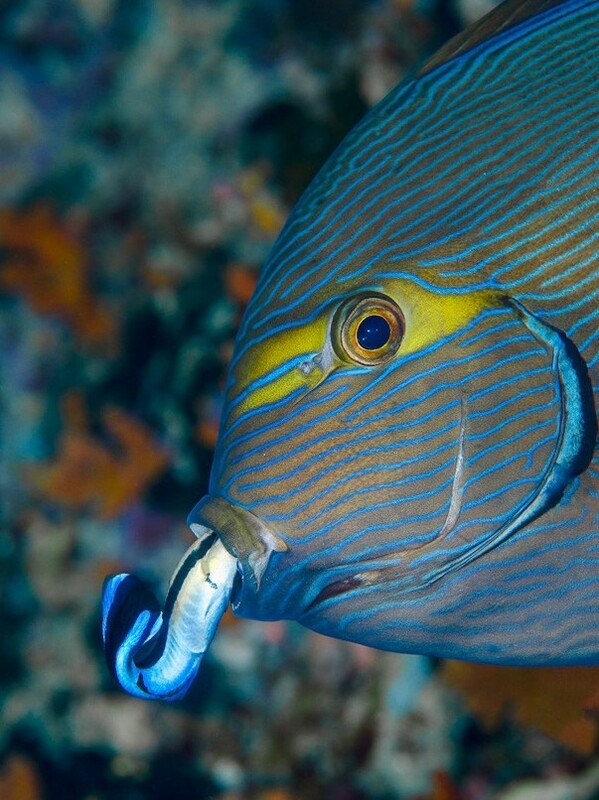 There are varied ways of acclimating saltwater fish & inverts. On this series we will start with the most intricate; the drip method. Always remember acclimation process should never be rushed. Also, remember to keep your aquarium lights off for at least four hours after the specimens are introduced into the aquarium to help them further adjust. A clean 3 or 5-gallon bucket designated for aquarium use only. If acclimating both fish and invertebrates, use a separate bucket for each. Using airline tubing set up and run a siphon drip line from the main aquarium to each bucket. You’ll need separate airline tubing for each bucket used. Tie several loose knots in the airline tubing, or use a plastic or other non-metal airline control valve, (Fig. I), to regulate flow from the aquarium. It is also a good idea to secure the airline tubing in place with an airline holder. At this point, the specimens can be transferred to the aquarium. Sponges, clams, and gorgonias should never be directly exposed to air. Gently scoop them out of the drip bucket with the specimen bag, making sure they’re fully covered in water. Submerge the bag underwater in the aquarium and gently remove the specimen from the bag. Next, seal off the bag underwater by twisting the opening, and remove it from the aquarium. Discard both the bag and the enclosed water. A tiny amount of the diluted water will escape into the aquarium; this is OK. Also, to avoid damage, please remember never to touch the “fleshy” part of live coral when handling. Be patient – never rush the acclimation procedure. The total acclimation time for your new arrival should between 1-3hrs. Never place an air stone into the shipping bag when acclimating your new arrival. This will increase the pH of the shipping water too quickly and expose your new arrival to lethal ammonia. Sponges, clams, scallops, and gorgonias should never be directly exposed to air. Follow the acclimation procedure, but instead of netting the specimen out of the shipping bag, submerge the bag underwater in the aquarium and remove the marine life from the bag. Seal off the shipping bag underwater by twisting the opening, and remove it from the aquarium. Discard both the shipping bag and the enclosed water. A tiny amount of the diluted shipping water will escape into the aquarium. Don’t be alarmed; this will have no adverse affect on the tank inhabitants. Solution 1: A plastic spaghetti strainer (found at your local discount store) can be used to contain a tank bully within the aquarium for several hours until the new arrival adjusts to its surroundings. Just float the perforated plastic basket in the aquarium. Net the tank bully and place in the floating basket for approximately four hours while the new arrival adjusts to your aquarium. Never place the new arrival in this basket; the new specimen must get familiar with your aquarium. By placing the tank bully in a perforated basket, you’ll reduce the stress on your newest tank mate. Some live corals produce excess slime when shipped. After the acclimation procedure is followed, hold the coral by the rock or skeletal base and gently shake the coral in the shipping bag before placing into the aquarium. To avoid damage, please remember never to touch the “fleshy” part of a live coral. Many species of coral will not open for several days after introduction into their new home. Please allow several days for the coral to adapt to the new conditions in the aquarium. Create suitable hiding spaces for every fish in the tank, otherwise, there are going to be fish that are stressed and bullied. 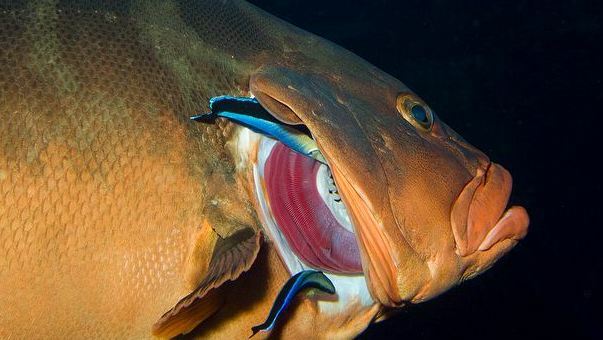 Unlike their wild environment, these fish are confined and cannot get away from aggressors. Aggression is a very real problem in many tanks that leads to many injuries, infections, and death. Do not overstock your tanks. Overstocking of the tank is a common problem that contributes to almost all of the stresses in the above list, from water pollution to oxygen depletion to harassment. If you want to stress your fish, put too many in the tank and it will happen every time. If you do not have a large enough tank to keep an entire school of fish, stick to fish that do fine as solitary fish or in pairs or trios. Keeping a schooling fish alone is not a good idea. These fish will tend to develop depression and may stop eating and swimming enough to stay healthy when kept by their lonesome. They also tend to express aggressive behavior towards their tank mates whereas they are actually peaceful in their group. Adding stuff to the water to treat a disease or water condition can be stressful to your fish. Try to avoid treating the water if at all possible and always use a quarantine or treatment tank. Copper is an excellent treatment for ich or velvet, but it can be toxic and stressful to fish. Of course, using it is much better than letting a fish die from velvet, but it should never be used in a tank with healthy fish. Improper nutrition is also a commonly overlooked stressor of fish. Many fish can live on minimal nutrition with old or stale flake foods, but this poor nutrition is a chronic stress. A variety of well-preserved dry foods as well as freeze-dried, fresh, and frozen foods specifically designed for individual species are necessary to prevent chronic nutritional stress. Disturbing the tank through banging on the glass, constantly netting fish, or rearranging decor stresses fish. This should be kept to a necessary minimum. Acclimation Series: What is acclimation? why should you acclimate? So you are pretty excited about your new arrivals, can’t wait to get them into your tank. But a short while after you get them into their new home, your new fellows just lies there, dead. What could be the problem? There is probably nothing more stressful to fish & inverts than bringing them from the wild through the wholesaler to your home. Within a short period of time, the fish was captured, held, packaged, shipped, sorted, handled, and packaged again, and so on through the collector, exporter, importer, wholesaler, and retailer to your tank. Throughout this process the livestock have undergone drastic changes in temperature, ammonia, pH, salinity, diet, medications etc. and arrive at your tank completely stressed. What some hobbyists do not realize is that if the fish are not handled very carefully and placed in an optimum environment, their stress levels will increase making them sick and they will eventually die. You first need to understand the stress factors and how one can eliminate them. A smooth transition is therefore to your tank is facilitated through proper acclimation. What is acclimation? Acclimation is the process whereby fish or invertebrates are transferred successfully from the shipping bag of water into your home aquarium. Why is acclimation important? Your new arrivals from the ocean are used to stability and any abrupt change to their environment could lead to stress, disease, or even death. It is very necessary to spend some time acclimating them to avoid any of the above scenarios. Temperature, pH and ammonia levels often go awry during shipping and long duration in a closed bag. You must also be aware of the salinity differences between the shipping water and your aquarium water; this can only be achieved through Acclimation. 1) Temperature- The proper way to slowly adjust the temperature of your newly arrived fish or invertebrate is to float the bag in your existing aquarium water under dim lighting conditions only. Do NOT float a bag under a set of intense and hot lights!! This will cause the water in the bag to heat up too rapidly, and can shock the new arrival due to the intensity of the light at the water’s surface. The best way to temperature acclimate is in a sump, refugium, or main tank with the lights out (or turned very dim if possible). Do not open the bag and start exchanging or dripping until the temperatures are equal inside the bag and inside the aquarium. 2) pH- The pH often drops during shipping, due to fish respiration and waste released into the shipping water. Acclimation will bring the pH in the bag gradually up to the pH level of your aquarium. The proper pH for your saltwater aquarium is 8.0-8.4; the proper pH for your freshwater aquarium is 7.0. The higher your tank pH the longer you should acclimate, but don’t generally exceed 60 minutes. On average, this process should last 20-45 minutes. It’s also important as you bring the pH up to add ammonia neutralizer, because as the PH increases in the bag, so does the toxicity of the ammonia. 3) Ammonia- Ammonia builds up in the shipping water due to fish and invertebrate waste in the bag. The lower pH in the shipping bag renders the ammonia less toxic. After temperature acclimation, we recommend a few drops of a commercial ammonia neutralizer, such as amquel, be added to the bag water. Once the neutralizer is added, begin adding tank water to the bag and removing shipping water gradually until you have exchanged at least 75% of the water, or proceed with drip acclimation at this time. So as you acclimate the pH will rise back up to tank levels and the ammonia will be diluted out. Never acclimate without ammonia neutralizer because as the pH in the bag rises, the ammonia in the bag becomes more toxic and will cause excess respiratory stress to the fish / invertebrate. 4) Salinity- Salinity or specific gravity, the amount of salt contained in the seawater, will generally not fluctuate during shipping. However, acclimation is very important to ease the transition from the bag salinity to the aquarium salinity. Wild fish live within very specific salinity levels. Their bodies work hard to maintain the osmotic gradient between themselves and their environment. If their environmental salinity is not specific to their needs and is not held at a steady level, they have to work harder to maintain their osmotic gradient, which generates chronic stress. We generally recommend at least 10-15 minutes of acclimation for every point difference between the two salinities. Example: The bag salinity is 1.026, the tank salinity is 1.022, that’s a 4-point difference in salinity, therefore acclimate for 40-60 minutes. Salinity of our shipping water will generally run 1.018-1.020 for fish, and 1.023-1.025 for inverts. We recommend testing the water upon arrival with a reliable refactometer, and not placing the fish or invert into the tank until the salinities are equal. The amazing thing about the ecosystem is the interdependence between species and their adaptations to the surrounding nature. It is a clear perspective of life. Symbiosis can be easily defined as a relationship of mutual benefit. In ecology however, it is used to define a state of close and prolonged association between two or more organisms of different species that normally benefits both members. This definition drives me to my next point. Mutualism- Occurs when both species benefit from the interaction. Commensalism- Occurs when only one species benefits and the other do not gain or lose anything. Parasitism- Takes place when only one species nourishes itself to the disadvantage of the other. In respect to the above definitions, the symbiotic relationship between the sea anemone and the clown fish (Pomacentridae allardi) can therefore be classified under “mutualism”. There are only 26 different species of clownfish and over 1000 species of sea anemones. But only 10 species of anemones can co exist with the clownfish species. The clown fish uses the sea anemones for protection against its natural predators. Clownfish can safely do so because its body releases a thick layer of mucus that protects it from the stings of the Sea anemone tentacles. In return, the clown fish also protects the anemone from fish that nibble its tentacles. One fish in particular that feeds on anemones are the butterfly fish. There are other benefits besides offering protection to each other. The clownfish also provides nutrients to the sea anemone in the form of wastes. Cases of clownfish luring other fishes to the anemones have also been witnessed. The sea anemones will then strike the advancing fish using its tentacles to dish out a paralyzing sting of nematocyst. •	The clownfish is born with a mucus layer that is already thicker than average, but as it grows, it can mix its mucus with that of the anemone’s to create a stronger barrier. So can clownfish survive without their anemones? The clown fish has more to benefit from the relationship than the anemone. From experience the question should be how long will the clownfish survive without an anemone? It is always advisable to pair up your clownfish with anemones. For this stories and more check out our website and catalogue. We also feature the best species of clown fish and carpet anemones. There are numerous functional fish that I can share with you and in time I will. As for today I will lay focus on the Salarias fasciatus or the Lawn mower blenny as it is commonly referred to. All their adaptation in nature makes them worthy occupants of aquarium tanks as cleaners. They are indeed known to have great appetite for filamentous algae. To begin with, Blennies are generally small fish, with elongated bodies and relatively large eyes and mouths. In nature, they spend much of their time as bottom dwellers and are quite isolated. From time to time they burrow in sandy substrates or inhabit cracks and crevices in reefs. In an aquarium set up the Salarius is considered an algivore (feeding on algae) but in the real sense it is a detrivore with plants only making 15% of its diet. Note: Detrivores are detritus feeders/eaters. They obtain nutrients by consuming detritus (decomposing plant and animal parts as well as feces). They are heavy feeders and it is why they thrive in an aquarium set up. • Easy to feed and keep. Can know if it’s hungry by simply checking if its belly is swollen or not. • They stir up sediment on rock, putting detritus in suspension where it can be removed by mechanical filters (larger individuals are especially good at stirring up detritus). • They are disease resistant and have been known to resist marine diseases like the ich because of their lack of scales like other marine fishes. • They have a good attitude and can be considered peaceful. They have been known to be only aggressive to fishes of its species and sometimes fishes smaller than its size. I consider the Salarius f. quite an interesting addition in any aquarium set up; a fish that will literally earn its keep by devouring all the nuisance algae can bring in tanks.